CBPN598A Years:1939&Up Drawbar Check Chain Kit. 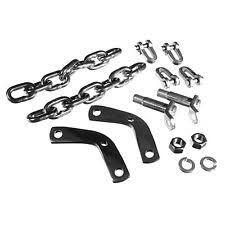 Drawbar Check Chain Kit Includes: RH/LH Anchors, 2 Eyelets, 2 Chains, 4 Clevis With Pins And Hardware. Fits Ford Tractors: 1801 Indust/Const, 1811 Indust/Const, 1821 Indust/Const, 1841 Indust/Const, 1871 Indust/Const, 1881 Indust/Const, 2000, 2000 Series 4 Cyl 62-64, 2030 Compact Tractor, 2031, 2111, 2131, 2300, 230A, 231, 2310, 233, 2600, 2600V, 2610, 2810, 2910, 2N, 3000, 3110, 3120, 3300, 333, 3330, 334, 335, 3400, 3500, 3600, 3600V, 3610, 4000, 4000 Series 4 Cyl 62-64, 4030, 4031, 4040, 4100, 4110, 4120, 4121, 4130, 4131, 4140, 501, 530A, 531, 541, 600, 600 Series 4 Cyl, 601, 611, 620, 621, 630, 631, 640, 641, 650, 651, 661, 671, 681, 700, 700 Series 4 Cyl, 701, 701 Series 4 Cyl, 740 Indust/Const, 741, 771, 800, 800 Series 4 Cyl, 801, 801 Series 4 Cyl, 811, 820, 821, 840, 841, 850, 851, 860, 861, 871, 881, 8N, 900, 900 Series 4 Cyl, 901, 901 Series 4 Cyl, 941, 950, 951, 960, 961, 981, 9N, Golden Jubilee, Jubilee, NAA, NAB. Replaces Ford Part Numbers: EC0N660A, NCA596B, NCA597B.